Detroit Quality Brushes is a company that does just what its name suggests: It makes high quality brushes in Detroit. Years ago, the company had 18 competitors in the United States. Today, there are only three left, says John Avgoustis, head of marketing and sales. “Walmart and others were a fundamental force in getting many companies to go the way of the dodo,” he said. Avgoustis was among some 2,000 executives from U.S. manufacturing companies who journeyed to Wal-Mart Stores Inc. headquarters here on July 7 to huddle in tiny conference rooms with Walmart buyers and present products made in the U.S.
Walmart’s 2015 U.S. Manufacturing Summit was advertised as a chance for goods producers to pitch American-made products to the retail giant. They would also get advice from Walmart executives on how to take advantage of the company’s recent efforts to support more U.S. manufacturing jobs and reverse the trends its purchasing strategies and demand for low prices have driven. But the event also highlighted the challenges facing companies trying to bring manufacturing jobs back to the United States. Cheaper energy and rising labor costs inChina have helped stabilize manufacturing employment in the U.S., but there are still roughly 5 million fewer Americans working in factories today than in 1990. Would-be Walmart vendors attending the summit had to establish that their so-called “Made in America” products are not just assembled domestically, but also made from component parts manufactured in the U.S. But some companies attending the summit said they have to rely on imported parts or materials because their one-time U.S.-based suppliers have been put out of business by foreign rivals. Walmart’s “Made in the USA” efforts go back to 2013, when the company came under increasing pressure from unions and other critics who said its drive for low cost goods was undermining American jobs. Walmart says it wants to spend $250 billion on American-made products by 2023, and says buying from U.S. producers is good business. Harold Sirkin, a managing director at Boston Consulting Group, says Walmart’s drive to buy American, and similar moves by big importers such as sportswear maker Nike Inc., are, in part, a response to Chinese labor costs that have hit 61 percent of U.S. levels, compared to 17 percent of U.S. levels 15 years ago. When supply chain and transport costs are figured in, American manufacturers can now compete, he said. That is what worries Jack Sloan, vice president of sales at SFH Company LLC. 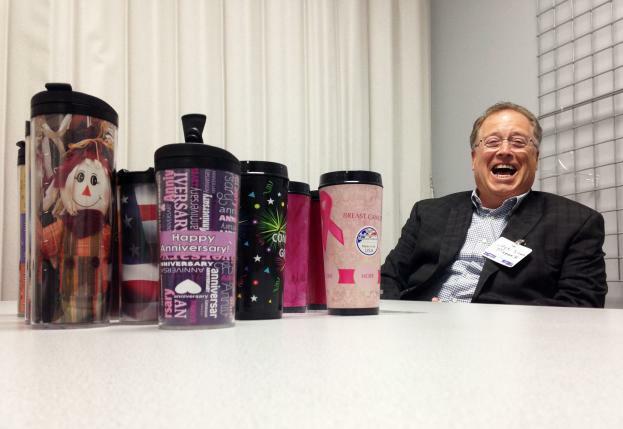 Sloan came to Bentonville hoping to sell customizable plastic travel mugs made by SFH’s Chicago-based Magenta unit from American-sourced plastic, with a recommended retail price of $6.99, about $1.50 cheaper than mugs he’d seen on Walmart’s shelves. His pitch went well, and the buyer asked him to come up with suggestions for Valentine’s Day, Mother’s Day and Back to School promotions in a test run at Walmart stores. Jeff Kjar and Shellie Slade of Utah-based Elk Management had a tougher time pitching their American-made clothing line to five Walmart executives gathered in a 10 foot by 12 foot windowless room. Kjar said Elk was willing to build a new factory to handle Walmart business, but they could not compete with a $1.68 camisole the retailer currently sells. The executives, who included Walmart category director for ladies apparel Kellie Mullins and David Adams, a divisional merchandise manager, responded that Walmart customers expect $1.68 camisoles, but will also pay higher prices for better-quality clothing. They advised Kjar and Slade to aim for that higher-end, but they also offered a caution: The company should double check that the spandex it uses is American-made. The clothing manufacturers have since discovered that their spandex was imported, and they have found a domestic source instead. But many would-be Walmart suppliers say producing goods entirely made from American materials presents a major challenge. K’Nex Brands, a Walmart supplier, manufactures Lincoln Logs, an iconic wooden American toy that has been made in China for 60 years. Chief executive Michael Araten says the company set out four years ago to move production back to America and did test runs with furniture makers. But the U.S. makers had trouble producing the small wooden logs to scale. The company finally tapped golf tee maker PrideSports, which found moving up in scale feasible, and K’Nex recently launched production in Maine at a competitive cost. Satisfying Walmart’s criteria for Made in the USA products remains an issue for Detroit Quality Brushes, a family owned company founded in 1887. Avgoustis said the company purchases wood for its brushes from Sri Lanka, and bristles from Sri Lanka or Mexico, because the American suppliers it once used have all gone out of business. Walmart buyer William Loan suggested the company return to pitch samples of plastic brushes. Avgoustis said he has seen other brush companies invest in U.S. production facilities only to have retailers abandon their products in favor of cheaper, foreign-made products. But Detroit Quality Brushes has extra factory capacity, and Avgoustis said that may make it possible to produce brushes with American-made plastic that could carry a “Made in USA” label without a huge expenditure. It is, he said, worth a try. Wal Mart in the past has been known to force suppliers to the lowest price on their products…if they do not turn that around to a ‘made in usa’ standard eventually they will be driven out of business…they have been practicing ‘economic terrorism’ for years accepting a majority of foreign manufacturers…Sam Walton would hang every one of them!!! Negative socio-economic culture transformation….NSECT… That is the label I put on what is happening in this country. The right wing conservatives will say…”Sounds like a liberal label to me! !” Not really, an independent voter here…but lets quit wasting time and get down to work. To start with…fast track is going to play a big part in NSECT becoming a reality. Jobs that minimum educated people and new immigrants could do are being outsourced to foreign countries. The college educated people in control of the government are overlooking a very important fact of life…there are millions and will be millions of people that will not go to college for a variety of reasons. They can’t get the money, they have had to work and they don’t have the grades, they are interested in trades that really require a different kind of training or they are just are not college types and want to work at an 8 hour job and go home to their families. 1. Private investment money for manufacturing in the United States. 2. The hope of blue collar workers, veterans, young less educated workers, new college graduates and immigrants for gainfull work that can lead to a better future. 3.A chance for an expanding solid economy not based on ‘service’ type work but based on manufacturing. I really think people in this country have forgotten how this countries economy grew to be the best in the world! Conservative politicians parrot the phrase “where are the jobs?” They are outsourced and globalization is NOT friendly to this country.